Josie’ latest assignment includes taste testing some of St. Louis’ local cuisine for a City Eats Food tour. One of her stops includes a restaurant owned by one of Josie’s mom’s friends so they head there first. Tillie’s Off the Hill is known for its toasted ravioli and Josie can’t wait to try it. The ravioli passes inspection but the clientele of the restaurant falls far below standard. One in particular is awfully unruly. When he becomes the victim of poison linked directly to the food he is served at Tillie’s the question becomes was he the real target or was someone trying to ruin the restaurant’s reputation. The police believe Tillie was trying to get rid of her customer permanently and arrest her for the crime. Josie’s mom makes it clear to Josie she must find the real culprit as soon as possible. So Josie’s is soon up to her neck in the investigation. She hopes to find that Tillie’s cooking is not what did her customer in, but that someone else served up death on a platter. I learned a lot about the foods that make St. Louis famous in this story, a few I wouldn’t even go near, but that didn’t keep me from loving this story. In fact most of Josie’s comments and reactions made my laugh out loud. Josie just can’t say no to her mom and there were times I really wish she could as she kept putting herself in danger, but seriously how many of can say no to our mothers. This character is real through and through as are all the others which is why we invest our time into seeing what they are up to in each installment of this series. The plot in this installment was very good too as we traveled to and fro trying to figure out who-dun-it. 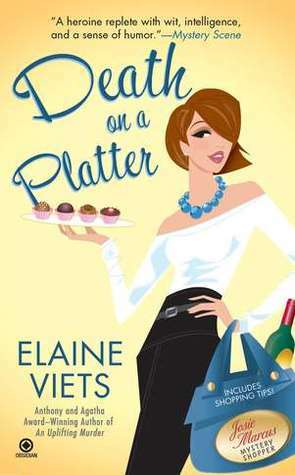 Elaine Viets knows her stuff when it comes to cozy mysteries. She writes fun, fast paced mysteries with plucky protagonist that keeps us coming back for more. Awesome review. Thank you for sharing with us. And man, gotta love that cover! I have read a couple books in this series and really enjoyed them! Thanks for the review. Sounds like a great story. Cute cover.